Post-Holiday Clearance - Buy TWO 9pc Cottontails or 6pc Bunny & Egg boxes, Get a 3rd for FREE! Offer Valid ONLY While Supplies Last! Use Promo Code HOPHOP at Checkout! Enter the following information and you will be notified once the item is in stock. Sign up to receive special promotions, catalogs, and new product announcements! 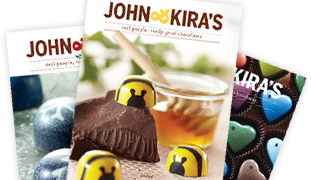 John and Kira's online shop features gourmet chocolate gifts and handmade confections for all occasions, including corporate gifts, holiday gifts, birthday gifts, and business gifts. Real people, REALLY good chocolates. © 2019. John & Kira's Chocolates. All rights reserved. Qty: " + prod.qty + "
Item No. " + prod.sku + "
" + prod.price + " each x " + prod.qty + " = " + (prod.price * prod.qty).toFixed(2) + "